Red Hat provides PackageKit for viewing, managing, updating, installing and uninstalling packages compatible with your system. PackageKit consists of several graphical interfaces that can be opened from the GNOME panel menu, or from the Notification Area when PackageKit alerts you that updates are available. For more information on PackageKit's architecture and available front ends, see Section 9.3, “PackageKit Architecture”. PackageKit displays a starburst icon in the Notification Area whenever updates are available to be installed on your system. Clicking on the notification icon opens the Software Update window. Alternatively, you can open Software Updates by clicking System → Administration → Software Update from the GNOME panel, or running the gpk-update-viewer command at the shell prompt. 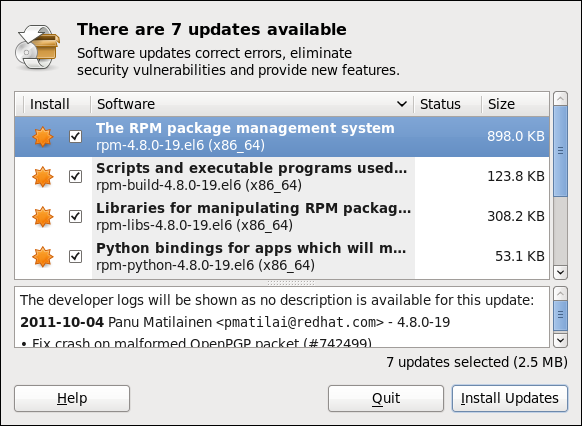 In the Software Updates window, all available updates are listed along with the names of the packages being updated (minus the .rpm suffix, but including the CPU architecture), a short summary of the package, and, usually, short descriptions of the changes the update provides. Any updates you do not want to install can be de-selected here by unchecking the check box corresponding to the update. The updates presented in the Software Updates window only represent the currently-installed packages on your system for which updates are available; dependencies of those packages, whether they are existing packages on your system or new ones, are not shown until you click Install Updates. PackageKit utilizes the fine-grained user authentication capabilities provided by the PolicyKit toolkit whenever you request it to make changes to the system. Whenever you instruct PackageKit to update, install or remove packages, you will be prompted to enter the superuser password before changes are made to the system. If you instruct PackageKit to update the kernel package, then it will prompt you after installation, asking you whether you want to reboot the system and thereby boot into the newly-installed kernel. 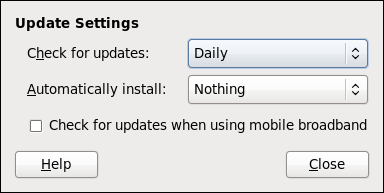 Right-clicking on PackageKit's Notification Area icon and clicking Preferences opens the Software Update Preferences window, where you can define the interval at which PackageKit checks for package updates, as well as whether or not to automatically install all updates or only security updates. Leaving the Check for updates when using mobile broadband box unchecked is handy for avoiding extraneous bandwidth usage when using a wireless connection on which you are charged for the amount of data you download.